SUVs and superminis are set to triumph over the rest of the automotive world in 2018. 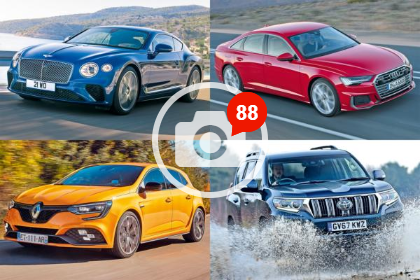 Auto Express have run down the best new cars for 2018. See below to see more details on the Toyota models that have made it onto Auto Express’ list of best new cars of 2018. Four years after the Mk2 Toyota Aygo first appeared, a facelifted version is set to go on sale later this year. Although the X-shaped profile on the nose remains, there are plenty of design changes, such as the LED headlights that sit above new fake grille trim pieces, while the grille is more emphasised, with horizontal slats and a tweaked front apron housing new foglamps. Inside, the changes are more minor, but the 1.0-litre engine has been revised to meet the latest emissions standards and to boost its economy and refinement. As well as unveiling the new Aygo and Supra, Toyota has recently taken the wraps off its third-generation Auris hatch. Based on the platform of the Prius and C-HR SUV, the Golf rival looks distinctive and more dramatic, with wraparound lights and a more subtle kink in the rear window than on the car it replaces. Inside it’s getting a thorough overhaul, with similar infotainment to what you’ll find in the C-HR. Toyota has confirmed that the Auris will be available with a new 2.0-litre full-hybrid powertrain, too. The Land Cruiser is one of the longest-standing off-roaders, and 2018’s revamp sees three and five-door models, plus five and seven-seat layouts, carried over. However, for the first time the range will kick off with a ‘workhorse’ Utility version. New bumpers and fresh tail-lights set the latest model apart, but what hasn’t changed is the 2.8-litre turbodiesel providing the power. Or if you would like to test drive any of our models, please feel free to book an appointment with our team.